HOUGHTON — Young children are naturally curious about everything around them. They want to know how and why things work. But sometime around middle school, many children lose that natural attraction to science and engineering. A team of university and public school educators in Michigan say they know what’s wrong with middle school science education. And with a $5 million, three-year grant from the Herbert H. and Grace A. Dow Foundation, they intend to develop and test some solutions. 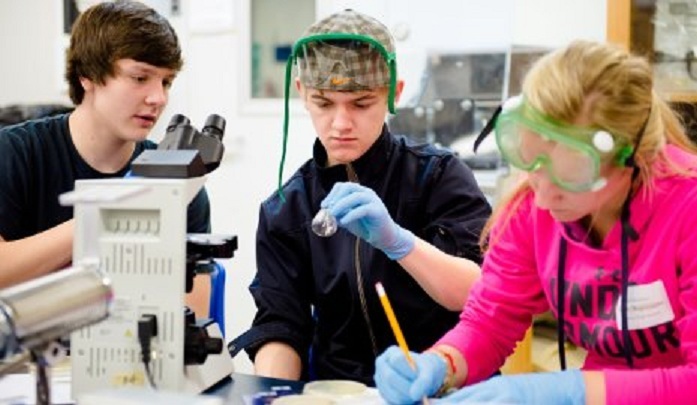 “In Michigan and most of the nation’s schools, STEM instruction consists of a series of seemingly unrelated courses that require students to memorize large numbers of facts but fail to engage them in the practice of using science as a tool to address real-world problems,” said Jacqueline Huntoon, a geology professor, associate provost and dean of the Graduate School at Michigan Technological University. The Herbert H. and Grace A. Dow Foundation, based in Midland, has funded the Michigan Science Teaching and Assessment Reform (Mi-STAR) program to develop a model for reforming middle-school STEM education that will include a new curriculum supported by updated teacher education and teacher professional development strategies. The program focuses on integrating the sciences, using a problem-based approach, cutting across the traditional disciplines of biology, physics, chemistry and earth science to emphasize core ideas and show how science can be used to address society’s needs. Huntoon will direct the Mi-STAR project in collaboration with four other Michigan Tech faculty members — Brad Baltensperger, Amy Lark, Doug Oppliger and Chris Wojick. Faculty members from Grand Valley State and Western Michigan Universities and a scientist from the American Geosciences Institute will also be heavily involved in helping the program achieve its goals. Additional team members include representatives from schools where the pilot project will be tested — the Midland, Grand Rapids and Eaton Rapids public school districts, and the Calumet-Laurium-Keweenaw and Houghton-Portage Township schools. Also represented on the team will be faculty members from other Michigan universities: Saginaw Valley State, Central Michigan, Michigan State and Eastern Michigan. The team will collaborate with the Michigan Department of Education, Michigan Science Teachers Association, American Chemical Society, American Institute of Biological Sciences and American Physical Society. “Most of the members of this team have been working together for many years, and our plans are informed by our experiences in many other STEM education projects,” Huntoon said. Mi-STAR has been in the making for nearly a decade. It is a direct outgrowth of MiTEP (Michigan Teacher Excellence Program), a National Science Foundation-funded partnership among Michigan Tech and Grand Rapids, Kalamazoo and Jackson Public Schools. It builds on research conducted by the National Academies of Sciences and Engineering. The project will test its reforms in the partnering public schools. If successful, Huntoon says, Mi-STAR will be a model for improving STEM education across Michigan and throughout the United States. A Michigan Tech alumna herself, Schrauben earned a master of science degree in applied science education and has worked with the University on previous science education projects, including MiTEP.